The Company Store is celebrating their 100th anniversary (wow!) by giving back to the community! Today they launched their Kids’ Design Contest with the goal of inspiring creativity and supporting art education and charitable work among children. The prize is pretty amazing and I can only imagine the excitement of the child who wins this contest. The winner will have their submission transformed into a comforter print for The Company Store’s ongoing Buy One, Give One Comforter Donation Program (where each time they sell a comforter they give one to a homeless child). 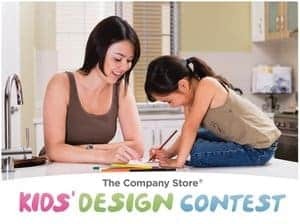 To enter, kids age 12 and under can upload their original artwork to The Company Kids Facebook page. You can find the contest tab under Kids’ Design Contest on the left hand side under the picture. In addition, there’s also gift cards to be won as well- $500, $250 and $100! Voting will take place from March 28th to April 22nd and the child with the most votes wins! This contest is open to US only. Please visit The Company Kids Facebook page to enter or to see full contest rules. I’m looking forward to seeing all the kid’s artistic submissions!